I'm looking at a bike that costs $800 more with Ultegra components than 105 (it has disc brakes). How much better is Ultegra? As Kerry asks...how long is a piece of string? No way to answer that question. Would you spend the extra $800 for Ultegra? Which bikes are they? Many times the frame will also be upgraded. With Trek it's really hard to make this comparison because the it's not only a 105 to Ultegra upgrade. You will not see $800 worth of speed increase. Buy it if you can afford it, otherwise don't lose sleep over your choice. The most obvious, easy to advertise benefit is less weight, but that is minimal in the overall scheme. What's the pocket book say? Orbea Gain M20 vs. M30. Same frame and wheels. The only difference is the stem and bars plus Ultegra vs. 105. You won’t likely see any improvement in shifting or brake performance. With the 105 5800 group, Shimano seemed to have hit the sweet spot with price vs. performance. The 7000 group only got better. 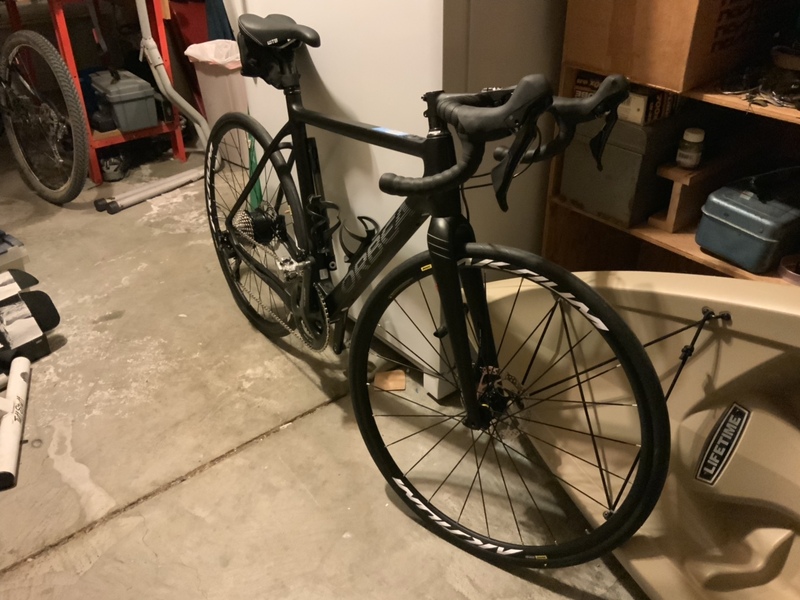 I’ve used Ultegra for 20+ years, built my last with 5800. It is terrific. Thanks for that. My past bikes have been Ultegra also. I added up the weight and I'd save only about 0.33 pounds of weight with Ultegra. I could put that $800 saved towards other things. I was interested in what CX would say about the mechanics of the two groups since he works on them. Are there differences in pivot bearings, longevity? Last edited by mfdemicco; 01-20-2019 at 01:18 PM. I've ridden them both. Currently on Ultegra 6800. There is no difference in performance other than weight. Ultegra is lighter and so is your wallet. Save the $800 and put that into better wheels. Save the $800 and put that into better wheels. Both bikes have hydraulic disc brakes? If so, I'd agree with the frdfandc... you probably won't gain much by going Ultegra so save the cash for other upgrades or needs. Better yet, take that $800 and buy a smart trainer and get on Zwift or some other online riding site. It'll help you to stay in-shape all year long regardless of the weather. You're welcome. IMO if one takes emotion out of the decision its a no brainer--go with the 105. The biggest one level egregious difference in price of the entire Shimano drivetrains is the 105 and Ultetegra. Most serious experienced riders can't tell the difference based upon shifting between the two. If you have somewhere you could wisely spend the $800.00 go for the 105. As the others have posted it's very close to Ultegra in performance and weight. I haven't experienced any differences in the areas you mentioned. If braking performance is at all an issue I might upgrade the rotors to Ultegra, but that's about it. That would still leave you a bunch of $$$ to upgrade the wheels if you want to. 105 is great stuff. Thanks all. I bought the bike with 105. Yes! Let's see the new bike! I'd be shocked if that was the entire story. I'd guess they have different wheels and who knows what else also. I compared the two bikes' spec sheets side by side on the Orbea website. Everything was the same except the stem and bar. Same wheels, tires, saddle, frame, etc. The tires are tubeless but tubes were installed. I think the rim tape/strip is tubeless also, as it's a blue translucent plastic, but don't know. Is the Mavic tubeless rim strip that color? It's an eBike. At 28lbs, weight is irrelevant. Go with 105. I didn't realize that till your post, and no I'm wondering why a compact crank. To get it up hills if the battery dies? Yes, probably right. I took the bike out for a hilly 25 mile ride and used up more than half the battery, so unless I use it more sparingly on a longer ride, I might run out of juice. They're supposed to be coming out with a bottle battery that doubles the battery capacity. I'll probably buy it. My first ride on road disc brakes. Pretty nice but I expected more power, frankly. 160mm rotors front and back too. Seemed on par with my rim brake bike with Kool Stop pads. The levers go almost all the way to the bar. Any way to have less brake lever stroke? I was looking for a free stroke adjustment but couldn't find it (read the Shimano manual), probably doesn't have one.